RCS Real Estate Advisors has been helping retailers and landlords find common ground since 1981. 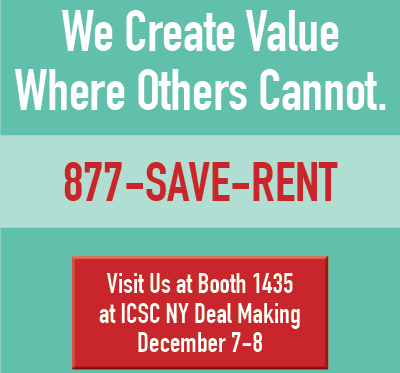 Whether your need is in restructuring leases, renewals, cost effective terminations, or new stores, contact us to schedule a meeting at the 2015 ICSC Deal Making to see how we can stregthen your position and improve your bottom line. Landlords want automatic annual occupancy cost increases of 3-5%. Their mantra is that they won't go backwards on rents and they are saying forget about early lease terminations. Retailers are experiencing soft sales, especially in malls where traffic is down. Rent as a percentage of sales keep increasing, while sales and gross margins do not. Once gross occupancy costs start to exceed 15% of sales, companies are in trouble. Most mature retailers we speak with are looking to not only reduce their costs, but to reduce their foorprint as well. In general they are of the opinion that this country is "over-stored" and the Internet continues to have a big impact on store sales. It's time the retailers and landlords reach common ground or we will have a redux of 2008. We selected RCS as we knew their long-standing senior level landlord relationships and their ability to partner effectiely with our internal real estate team were the right combination for success. We are very pleased with how right we were. RCS exceeded our expectations by delivering significant occupancy costs savings and achieving cost-effective terminations for Aeropostale. We greatly appreciate RCS helping us achieve our long-term goals.